Upon installation the plugin you will be allowed to let WP Car Manager setup 3 pages, including the 'Cars' (could be translated to your websites language) page that contains our listing shortcode. To list your vehicles on your page you simply add the [wpcm_cars] shortcode to a page. 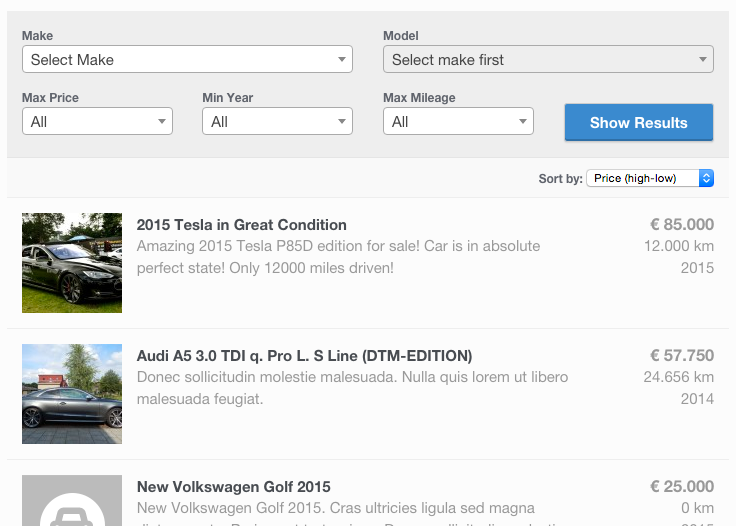 The vehicles list will include multiple filters to narrow down the results and the possibility to sort the results. You can choose to not display the filters and/or the sort feature via shortcode attributes. Setting show_filters to false will not output the filters and setting show_sort to false will not output the sorting select box. The [wpcm_cars] shortcode comes with various attributes you can use to alter the output of your listings. The table below lists what attributes are available and how to use them. The default value will always be the first listed value and will also be bold.